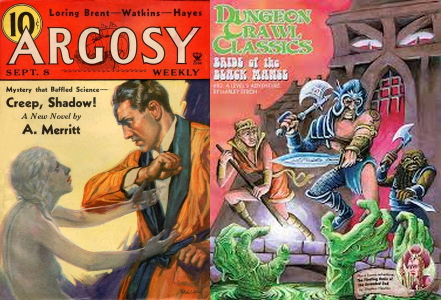 Sanctum Secorum #29 – Creep, Shadow! Get the free Sanctum Secorum #29 Companion HERE! Had the last King and Princess of wicked Ys, returned after three thousand years? Why were they creating an exact replica of Stonehenge on their New Jersey estate? What was the Mael Bennique, the Breaker of Chests? And what was the dread Gatherer in the Cairn? And can men and women really be turned into shadows and made the helpless slaves of the one who transformed them? Ethnologist Dr. Alan Caranac (who may just be the reincarnation of the Alain de Carnac who brought about the destruction of sinful Ys and its evil rulers) has to find out the answer, for one of his best friends has been killed, and perhaps transformed into a shadow, while his fiancee Helen, her brother, Bill, and the famed Dr. Lowell have already been marked for death or worse! But first Alan will have to enter the tower of the Demoiselle Dahut de Ys in New York and journey through it thousands of years into the past to her tower in the legendary city from which she draws her name. And then return, if he can! Welcome to the Sanctum Secorum podcast. Tonight we return to the printed page as we discuss A Merritt’s Creep, Shadow! while pairing it up with a Harley Stroh classic, The Bride of the Black Manse.